Back ache is the most common problem that people working in desk jobs are suffering with. The main reason is the long hours of sitting affecting the posture. As the body slouches, the shoulders drop forward, and the back gets rounded which puts lots of pressure on the lower back (a naturally vulnerable part of the human skeleton). Just 7 minutes of this simple routine can give relief and strengthen the back to prevent further injury. 1. Bhujangasana/ Cobra Pose :- It stretches the spine, opens the chest and the shoulders, strengthens the diaphragm. Hold the posture for 30 seconds with normal breathing. For more details about the posture check this link. 2. Tiryak Bhujangasana/ Swaying Cobra Pose:- Stretches the spine and the lower back muscles, opens the chest and shoulders, strengthens the diaphragm. Repeat on both sides for 30 seconds with normal breathing. For more details about the posture check this link. 3. Makarasana/ Crocodile Posture:- This posture encourages the vertebral column to assume its normal shape and release the compression of the nerves. Stay in variation 1 for about 30 seconds. In the variation 2 you have to lift your legs up alternately trying to kick the hips with the heels, repeat for 30 seconds breathing normally. For more details on the posture check this link. 4. Shashankasana/ Hare Posture :- Used to relax the body and calms the mind. It counteracts the backward bending postures, and will stretch the spine releasing any pressure on the disc. For more details on the posture check this link. Note: This posture should not be done if you have lumbar disc problems or sciatica. 5. Marichyasana C :– Particularly good for people with rounded shoulders, this asana opens the chest, and stretches your spine. The intercoastal muscles are also stretched helping you to breathe deeply. Stay in the posture for 30 seconds breathing deeply. Repeat on the other side. For more details on the posture check this link. 6. 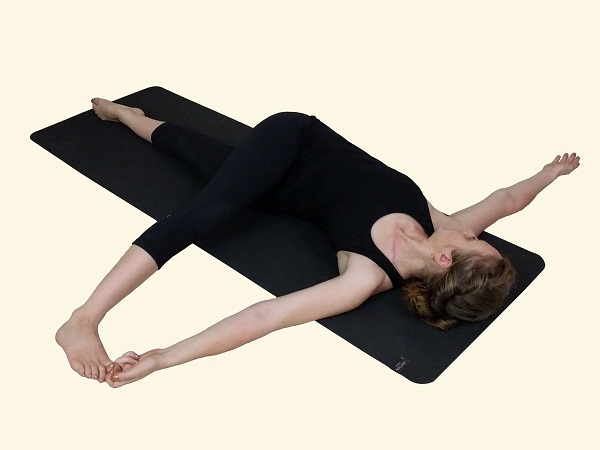 Supta padangustasana/ Reclining Hand To Toe Pose :- This posture is one of the best for lengthening hamstrings, and opening the hip without putting pressure on the lower back. 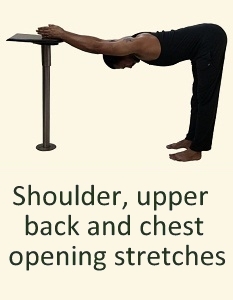 It creates a traction in the spine, lengthening it, and relieving plain. Start by using the help of a strap, until you feel comfortable holing your toe. Stay in the posture for about 30 seconds. Repeat on the other side. For more details about the posture check this link. 7. Parivrtta supata padangustasana/ Revolved Reclining Hand to Toe Pose:- This posture lengthens the hamstrings and stretches the lower back. You can use a strap around the foot if necessary. Stay in the posture for about 30 seconds breathing normally. Repeat on the other side for the same amount of time. For more details about the posture check this link. Disclaimer:- I am not a doctor. Before starting any new exercises/diet plan you should consult with your doctor/physician. If you have back conditions like sciatica, slip disc, herniation, fusion of lumbar spine then the postures might need modifications. It is always recommended to consult a qualified Yoga Therapist/Physiotherapist before trying any posture.